Here are video clips of the Storm Education Team in the news and in the field. These are individual clips you'll find in the collections above, plus some others from years past. 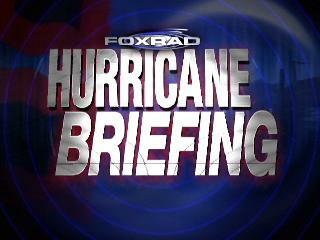 For The 2 Month Anniversary of Hurricane Ike's Landfall In Texas, Fox26 Houston Invited Us On. We visited over 30 cities across the country during a "satellite media tour"
on April 4th, 2007 from the National Hurricane Conference in New Orleans. These are clips from various news appearances, storms and news specials. field from SET2 & data gathering with SET1 Watch It. You can see News-14's entire story on their site too. how we approach documenting storms. You can see NBC-17's web stories here and here. truck in Naples. See it here. in Naples. See it here. wide area. See it here. We had a building implosion in our base, Raleigh NC. See it here. what could happen this year. Hear part 1 here. gear in Naples. See it here. we were in Naples. See it here. toward the NC coast. See it here. Hurricane Ophelia's damage could have been much worse if the track had held. It looks like sound side surge hurt more than wind in most areas. See it here. Suburban during the one hour special. See it here. weather for the coverage See it here. with major damage. NO injuiries.See it here. in Foley Alabama See it here. Event, too. See it here. Hurricane Prep Event. See it here. NBC-17 featured us in the show. See it here. Home Depot Hurricane Prep Event. See it here. in the Triangle. See it here. "tornado day" during severe weather awareness week. See it here. 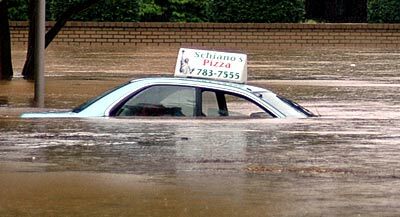 Hurricane Floyd struck North Carolina in September 15th-16th, 1999. This is a short clip of flooding aftermath in Raleigh and Nashville, North Carolina. On January 24th-25th, a totally unprecedented snow storm hit North Carolina. In Raleigh, the official snow total was 20.3 inches; a record breaking storm had struck. Here's a brief look at that snowfall. During the 4th winter storm of Winter 99-00, StormStudy project lead, John Van Pelt, appeared on InDepth on NBC-17 WNCN, Raleigh, North Carolina, to talk about StormStudy & Skywarn. 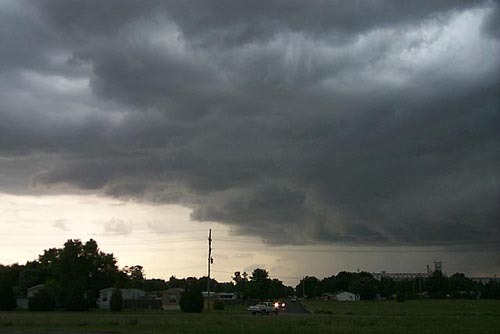 For Severe Weather Awareness Week, NBC-17's Emily Byrd does a great Severe Thunderstorm story. Central Carolina Skywarn's Emergency Coordinator, Thomas Babb is featured. to talk about StormStudy & Skywarn. We've been a lot of places and seen LOTS of serious weather. Here are some of our before, during and after shots. This photo updates from the StormStudy Truck every minute See it here. We saw major damage from the F3 that killed 8 See more here. We saw four tornadoes that day including a half mile wide F3 See them here. 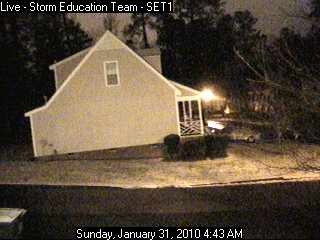 Storm Education Team members documented Hurricane Alex's Landfall in Haterras Village, NC in 2004. We saw the surge cover Highway 12 and plenty of damgae See it here. Storm Education Team members documented Hurricane Charley's Landfall near Punta Gorda, FL, in 2004. We had 133 MPH winds and major damage See it here. Storm Education Team members documented Hurricane Ivan's Landfall in Gulf Shores, Alabama in 2004. We saw frightening storm surge and major damage See it here. We saw some wind damage and sound side storm surge. See it here. Tropical Depression Alberto moved through central NC on July 14th, 2006, dropping nearly 8 inches of rain in a few hours. The flooding was the worst in Raleigh, NC since 1973. See some of the inundation here. From a physical damage standpoint, this was the worst natural disaster in N.C. since hurricane Floyd. At the peak of the storm's damage, over 1.2 million North Carolinians were without power. Many of them were still in the dark a week after the ice melted. See some of the image here. 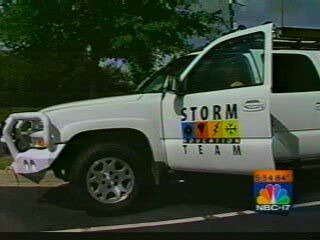 The trip ended Sunday, June 4rd, 2000 - The StormStudy Truck had seen 4100 miles since leaving Raleigh on Saturday, May 27th! It saw miles in North Carolina, Tennessee, Arkansas, Oklahoma, Missouri, Nebraska, Kansas, Iowa, Illinois, Indiana, Kentucky, West Virginia & Virginia before the trip was over! Storms were few and far between but a couple of good ones popped up here and there! The juice dried up on Thursday for most of the plains. 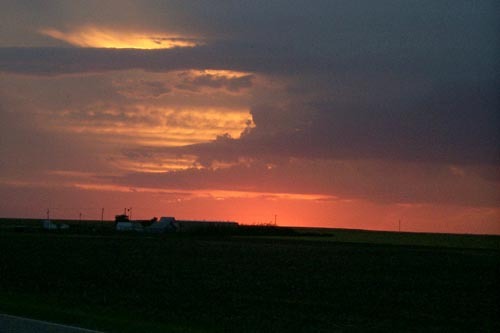 The back end of a great looking storm in Southern Nebraska. This storm was a textbook example of a well structured, although not very severe storm. Twenty minutes before this storm went over Hutchinson, Kansas, it was dropping buckets of hail on the StormStudy truck! The winds were 38MPH sustained and the rain and hail limited visibility to 20 feet. 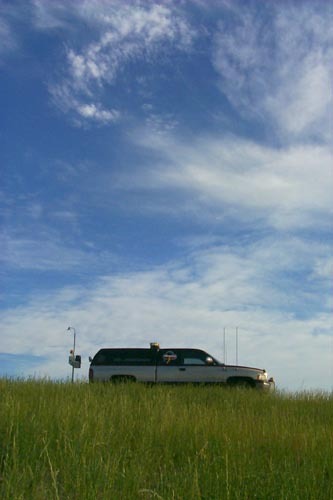 The StormStudy Truck on the plains under a stormless sky in Central Nebraska. 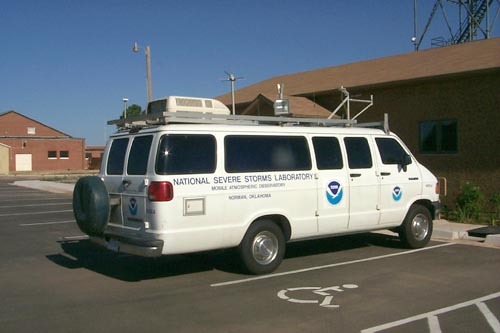 Here's one of the National Severe Storm Lab's data gathering vehicles in Norman, Oklahoma. 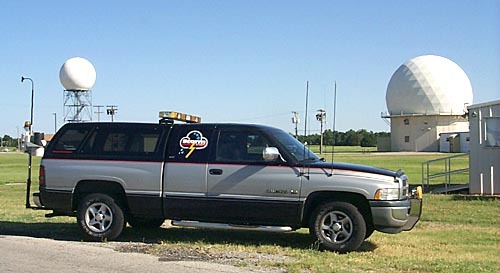 Here's the StormStudy truck in front of the current and retired radar sites at the Storm Prediction Center in Norman.